This map from Iowa Environmental Mesonet shows the extent of rainfall in Iowa this fall. These conditions have contributed to a delayed soybean harvest. Last week, Iowa saw up to four inches of rain rain, below-average temperatures, and 10 confirmed tornadoes. The unfavorable weather has made this year’s the slowest Iowa soybean harvest on record. As of Oct. 14, Iowa farmers had only harvested 14 percent of soybean acres in the state. , according to last week’s Iowa Crop Progress & Condition Report, put out by the National Agriculture Statistics Service. The report said that between the cold, rain and even snow, only 0.8 days during the week were suitable for fieldwork. At this time last year, about 30 percent of Iowa soybeans were off the field. In 2016, that number was closer to 50 percent. The 2018 Iowa Climate Statement, released last week, warns that extreme rainfall events will only get worse in Iowa as time goes on. Future years may see even later delays for harvests. Despite the slow harvest, the bean plants themselves are a bit ahead of schedule. The report said 97 percent of the soybean crop was dropping leaves as of the 14th, five days ahead of average. Wallace’s Farmer reported that in some fields, moisture has prompted beans to start sprouting out of their pods. Ideally, the beans only contain 13 percent moisture at harvest, but these wet conditions could cause the beans to absorb and store more water from the air, according to South Dakota’s Capital Journal. This could spell bad news for farmers, as many buyers only take dry soybeans. Farmers will have to wait longer to harvest or store their beans long-term. Dryer conditions this week should have provided some opportunity for farmers to catch up. Meanwhile, states in the eastern Corn Belt are reporting faster-than-average harvest, according to Wallace’s Farmer. This week’s on the radio discusses the sixth annual Iowa Climate Statement. The full statement can be found here. Transcript: The sixth annual Iowa Climate Statement was released on October fifth. The document, titled Iowa Climate Statement 2016: The Multiple Benefits of Climate-Smart Agriculture, was signed by 180 science researchers and faculty from thirty-eight Iowa colleges and universities. This year’s statement centers around Secretary of Agriculture Tom Vilsack’s U.S. Department of Agriculture Initiative “Building Blocks for Climate-Smart Agriculture.” Vilsack’s initiative aims to expand nation-wide voluntary, incentive-based programs for farmers to combat human-induced climate change. The climate statement champions proven conservation techniques such as planting perennial plants on marginal cropland and reduced-till or no till farming that would decrease nation-wide net emissions and increase carbon storage in soil. 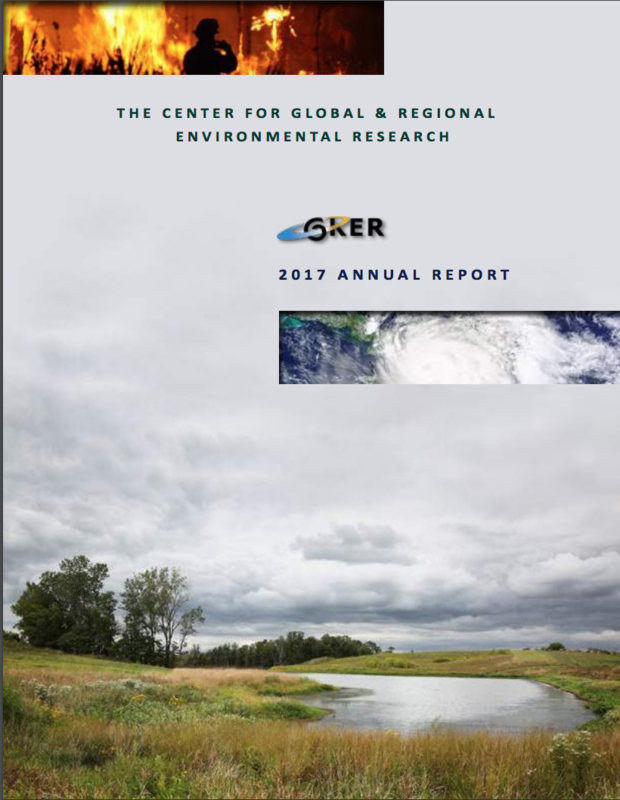 Statement authors note that the document is part of a larger effort, strengthened by the December 2015 Paris Climate Agreement, to offset human-caused climate change. For more information about the 2016 Iowa Climate Statement or to read the full document, visit iowaenvironmentalfocus.org. Iowa Climate Statement 2015: Time for Action was released more than two months ago but the news is still getting noticed by national media outlets. On Monday, Yale Climate Connections ran a radio piece about the statement which urges Iowa voters to ask presidential hopefuls to address climate-related issues while on the campaign trial. The piece interviewed Drake University environmental science and policy professor David Courard-Hauri who was also one of the statement’s lead authors. Iowa Climate Statement 2015 was signed by 188 scientists and researchers from 39 colleges and universities in the state. This marked the 5th installment of the series which started in 2011 with just 30 signers. With the 2016 presidential election just around the corner, the 2015 statement encourages Iowa voters to ask presidential candidates about climate policies they support during campaign stops in the Hawkeye State. Aside from coverage on Iowa Environmental Focus, the statement has also been noticed by local outlets such as the Cedar Rapids Gazette, WHO-TV, Iowa Public Radio, and Radio Iowa as well as national outlets like ThinkProgress and Al Jazeera America. The statement has also gotten much attention on social media, particularly Twitter. Every state must have a "Climate Statement. "What a brilliant idea Iowa has! Prominent scientists and teachers from around the state sign in! The authors of the 2015 statement hope to use Iowa’s role as the first in the nation caucus to bring attention to climate issues for both republican and democratic candidates. Iowa’s caucus takes place on February 1, 2016. 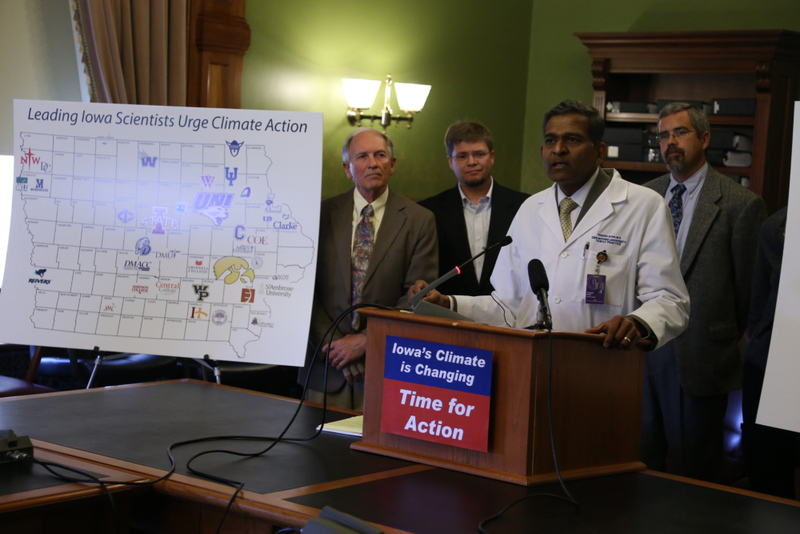 The 4th annual Iowa Climate Statement, signed by 180 researchers and scientists from 38 colleges and universities across the state, was released last month during a press conference at the state capitol. 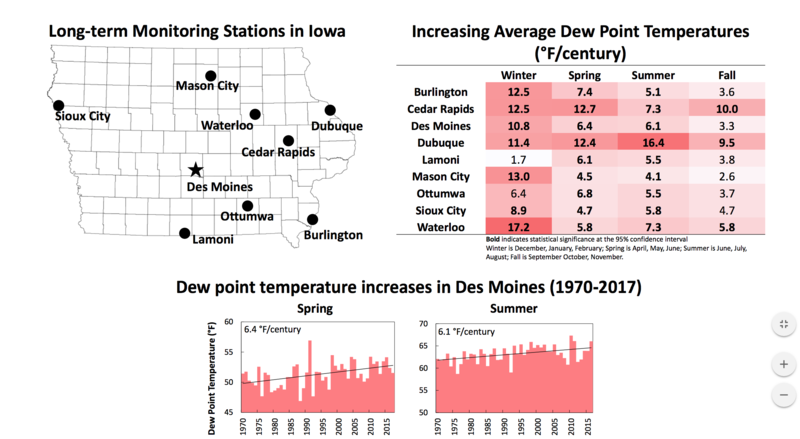 The Iowa Climate Statement 2014: Impacts on the Health of Iowans examines public health risks associated with climate change. Video from the event is now available below, along with photos (above). Please feel free to share the video using the share buttons attached.